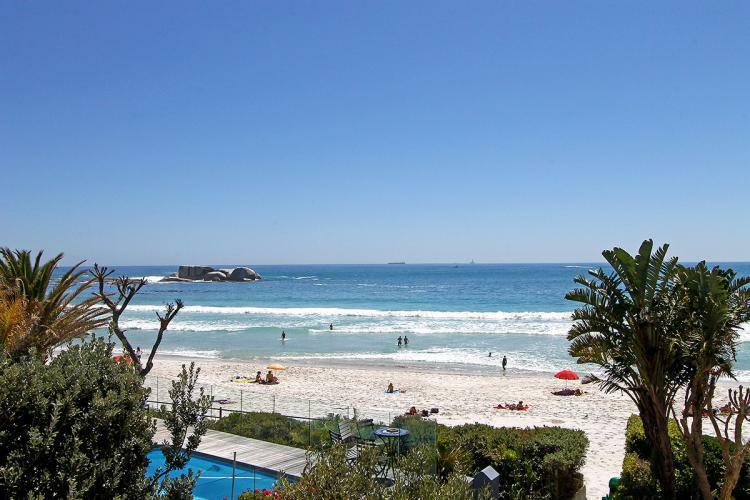 Camps Bay and the surrounding beach-front suburbs undoubtedly rank as Cape Town’s most sought after residential suburbs and holiday destinations. It’s unlikely that there is a single street address in or around Camps Bay that can’t claim to be ‘desirable’, but certain streets are most definitely a cut above the rest – such as nearby Nettleton Road in Clifton. Villas in the Camps Bay area are prized not only for size, architecture and luxury features, nor only for the wind-sheltered and west-facing location with incredible panoramic views of ocean and mountains, access to the best of Cape Town’s blue flag beaches and proximity to five star amenities in Camps Bay. They are prized for the predominant social standing of owners, lessors and lessees – including more than a smattering of international celebrities. Uppercrust addresses in the area rank as some of South Africa’s most expensive streets and these streets in particular boast properties starting at the R20 million ($1.4 million) mark at the very lower end, going up to the R50 million ($3 million) for an ‘average’ luxury villa and up to R100 million plus ($6 million) at the upper end. 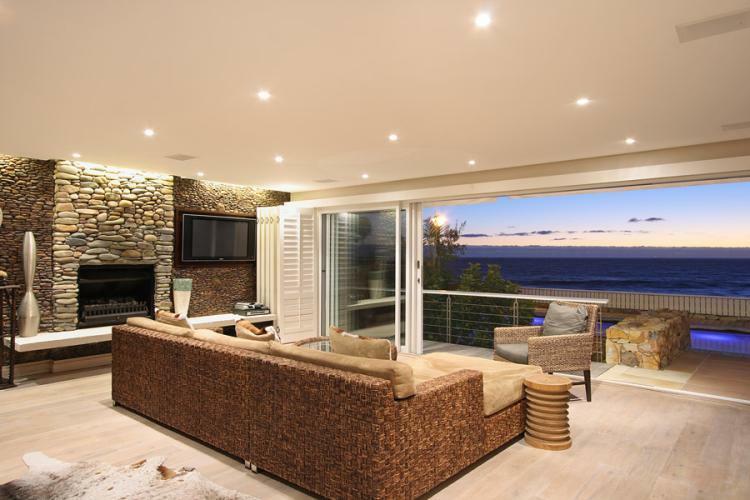 A villa in Clifton recently sold for R198 million ($13 million). In the very middle of this fairy-tale stretch of coastline you’ll find the beating heart of it all – the idyllic playground of the super-wealthy and / or super beautiful. Camps Bay has all the fine restaurants, shops, cocktail and tapas bars an tycoon or ‘It girl’ and her pooch could want or need, and all geared to serve the most discerning of visitors and residents, and more than its share of highly affordable top-notch luxury villa and apartment rentals – on some equally sought after streets – such as Victoria Rd, the ‘quiet roads’ directly behind it, and if you want to enjoy some of the finest views in the world: Geneva Drive and streets like Theresa Ave at the very top of Camps Bay. 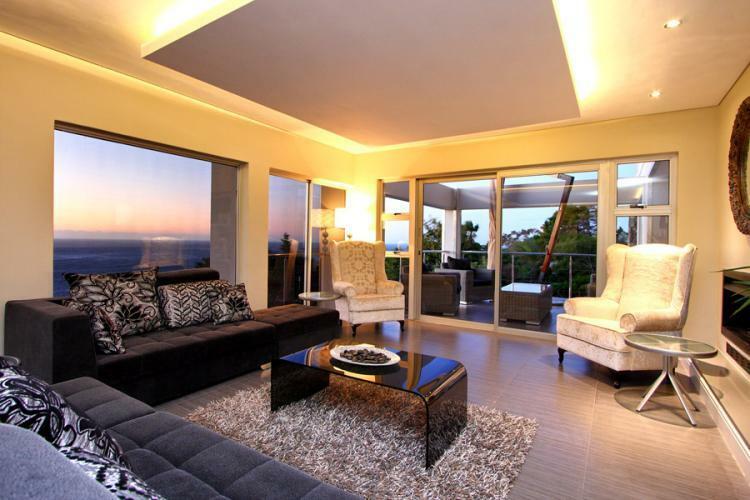 Enjoy the best views in Camps Bay from a luxury villa up top in Theresa Avenue or Geneva Drive. The luxury is unquestionable and the views are nothing short of unsurpassable, but that’s not all you get up here. With a nature reserve right behind you on these elevated streets, offering various trails, yet still only a couple of minutes’ drive down to the beach, so you’ll be getting the best of both worlds. 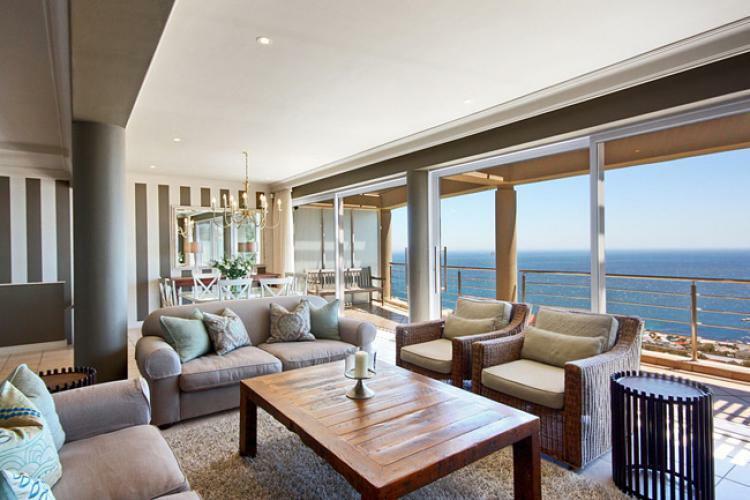 The magnificent nine-bedroom Villa Silva in Theresa Avenue is one of Camps Bay’s top properties, with some the best views over the luxury enclave and the ocean. Glorious summer sunsets flood the pale interior in a warm glow and shades of gold. The six-bedroom Apostle’s Edge villa is named for the mountain right behind it. Tucked at the foot of the famous ‘Twelve Apostles’ Mountain, in a quiet cul-de-sac, this villa offers complete privacy along with the expansive views over Camps Bay and the ocean. 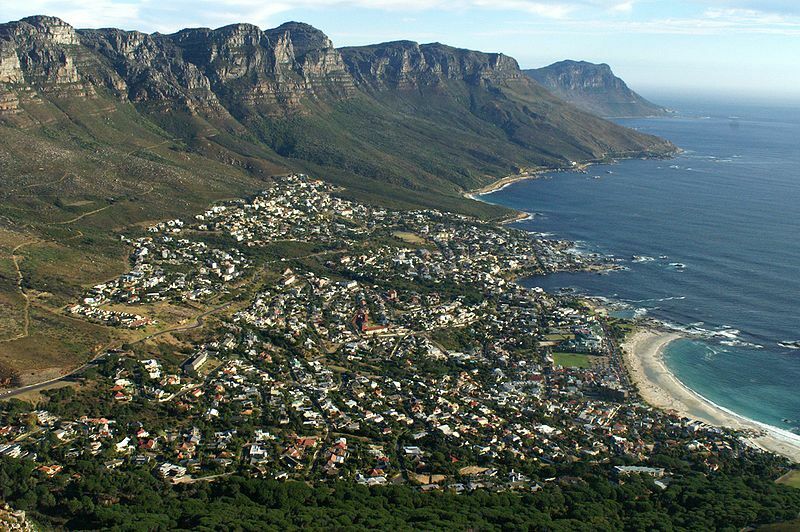 Victoria Road runs along the beach-front on the Atlantic side of the Cape Peninsula and through the heart of Camps Bay. As busy as it can be as a thoroughfare, it’s one of Camps Bay’s most desirable street locations for holidaymakers due to the proximity to the beach, shops and restaurants, not to mention the vibrant summer buzz. 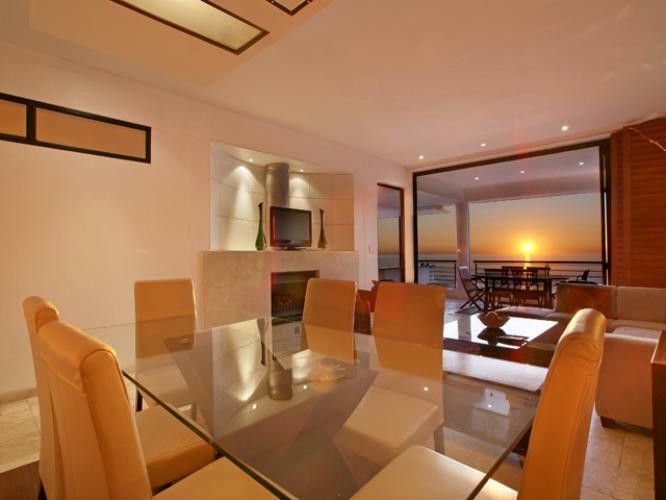 Glen Beach is arguably one of Camps Bay’s most recognised rental addresses on Victoria Road. This tiny exclusive little beach sits in the middle point of Camps Bay but still boats its own ‘exclusive’ profile of sought after villas. 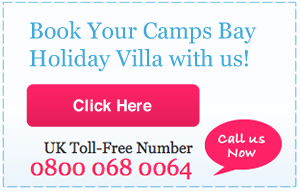 Holiday villas and apartments here include Glen Beach Villas and 12 Glen Beach – Main House. 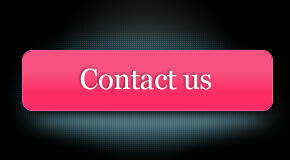 Or choose a quiet road in the exclusive and sough-after beach-suburb of Bakoven for easy access to the fun, and easy retreat to complete privacy in a villa or apartment such as Bali Luxury Suite E.
Some of the largest, most luxurious and most inaccessible testimonies to wealth and success line Clifton’s Nettleton Road, but while you may not always able to rent these magnificent villas, you can soak up the exclusive umbra anywhere in Clifton as it’s so small. So what about a beach house just down the road from Nettleton? Step out of your beach villa onto the sparking white sand of one of Clifton’s famous beaches, and make sure you are ready to meet somebody globally rich and famous. Clifton 4th is a delightfully and warmly decorated beach house metres from Clifton’s 4th beach, offering the perfect summer vacation for dining, drinking, playing and tycoon / celebrity spotting.